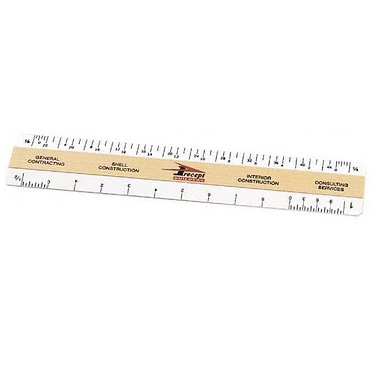 Architectural Four Bevel Ruler | Promotional Architectural Four Bevel Rulers imprinted with your logo. Architectural Four Bevel Ruler.Architectural four bevel ruler with maple wood frame & 4 white plastic scale walls 1/1/8-1/4 & 1/2-1 on front & 3/8-3/4 & 1 1/2-3 on back. Clear Vinyl Case / 25 lbs / 500 pcs. Imprint Area: 7/16" x 6"